The days of the green on black character based terminal with fixed type face and font size are, thankfully, a thing of the very distance past. These days we get to choose the font type, style and size of the words we view on our screens. This ability is of particular importance to those who may have difficulty reading smaller text on a screen. 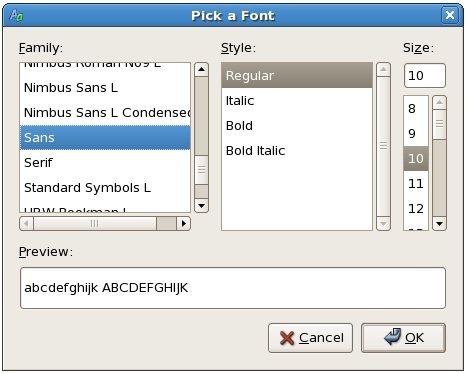 The Red Hat Enterprise Linux GNOME desktop, just like other desktops, allows the user to select the font type and size used to display text. The objective of this chapter, therefore, is to provide a brief overview of configuring these settings on the RHEL 5 desktop. Application font - The font used to display text in application windows. This also changes the font used to display items such as the menus in the desktop panel. Document font - Specifies the font that is to be used when displaying document text in an application. Desktop font - The font used to display text under the icons on the desktop (such as folder names). Window title font - The font used on the text in window titles. Fixed width font - Specifies the font to be used when the system needs to display fixed width font. A prime example of this is the text that is rendered in a Terminal window. In terms of font selection options, fonts may be specified by type (Utopia, Serif, Monospace etc), style (Regular, Bold, Italic) and size (10pt, 11pt etc). Once you have selected a suitable font, click on the OK button to apply the selection to the desktop settings. Monochrome - Displays text in black and white. This invariably results in characters having jagged edges. Best Shapes - Uses antialiasing to smooth the edges of the characters where possible. This is typically the preferred option when using a CRT based monitor. Best Contrast - The preferred option for visually impaired users. Uses antialiasing combined with adjustments to maximize the contrasts between the characters and the background. Subpixel Smoothing - Uses the shape of LCD pixels to render the smoothest possible fonts on LCD screens. 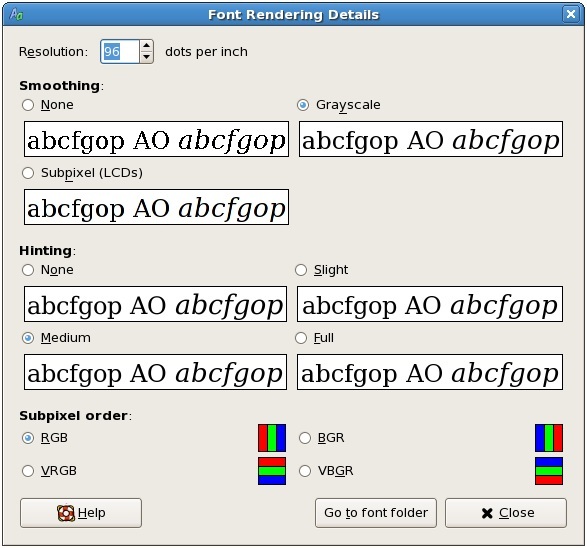 Resolution - Allows the resolution at which fonts are rendered to be defined in dots per inch. Smoothing - Defines how fonts are rendered when antialiasing is used. Available options are None, Subpixel and Grayscale. Hinting - A form of font rendering designed to improve the appearance of small sizes and low screen resolutions. Options available are None, Slight, Medium and Full. Subpixel Order - Specifies the pixel order for fonts. Meaningful only on LCD displays. Options are RGB, VRGB, BGR and VBGR. Fortunately, the settings panels ease the decision making process by showing you what text will look like base done each setting. The right setting is subjective and is really a matter of choosing what looks most pleasing to your eyes. Located at the bottom of the Font Rendering Details dialog is a button labeled Go to font folder. When selected, this button displays file browser window containing the contents of the font folder located on the system. If you have additional fonts that need to be added to the system, simply drag and drop them into this folder. This page was last modified on 27 October 2016, at 19:57.